This morning I stepped on a large Nylabone while walking across the kitchen floor. I'm not sure what's worse. Stepping on scattered Lego blocks or a heavily chewed Nylabone. I was barefoot. The door frame leading into the biscuit room was my saving grace. I restored balance. Dropped a few F-Bombs. Located an old pair of Crocs flip flops. Exhale. I headed towards my office. This requires me to walk through the living room. That's when I noticed it. The mess. I had just vacuumed yesterday and put the fur-kid's toys in their rightful places. A few are put in the doggy bed by the chair. 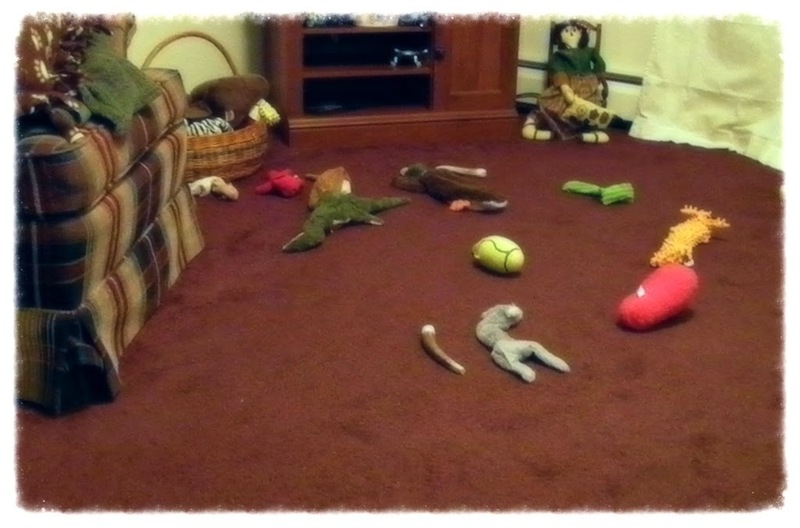 The other remaining mound o' toys are piled in a large doggy toy basket by the sofa. There are other toys scattered around the house...sofa, our bed, the office. My eyes scanned the living room floor. Dog hair. Biscuit crumbs. At least a dozen toys. And the kitchen? Two Nylabones, a Kong and 2 socks. One of the doggy blankets had peanut butter caked on from a peanut-butter-filled-Kong-rendezvous. It's times like this when I think about our friends with human kids. We've heard the rants about messy rooms, toys scattered on the floor, food lodged between sofa cushions, the never ending pile of laundry, etc. I've thrown in my two cents about having to vacuum every day, the amount of doggy blankets we wash a week, meal prep (we don't purchase store-bought dog food), etc. The response is usually an awkward silence. Was I not supposed to say anything? Does our human-child-free home make our tedious daily chores less daunting? 1. Human clothes. Forget it. 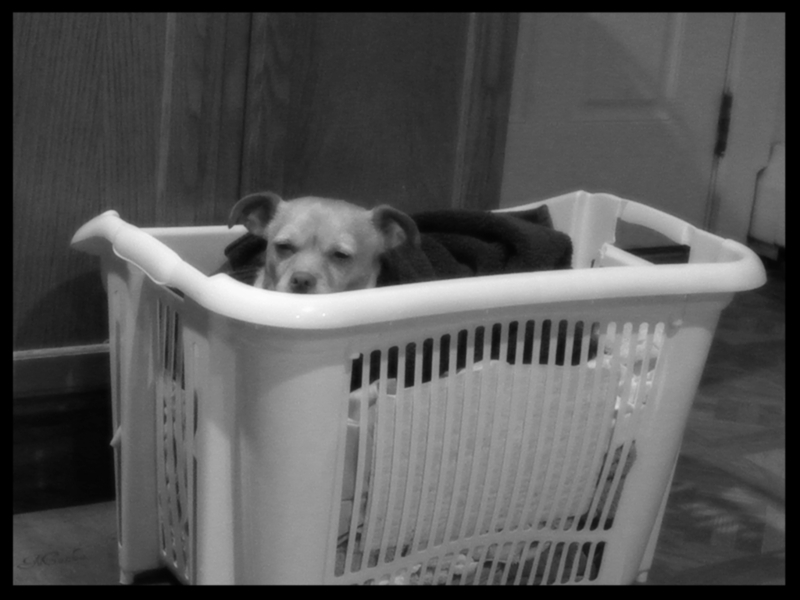 Our kids view a basket of warm clothes from the dryer as a napping spot. 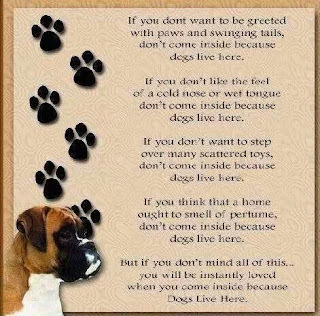 Top that with constant pup hugs, dog hair on the furniture, a fur-kid in my arms or asleep on my lap, etc, dog hair is a permanent part of our wardrobe. We don't bother with lint brushes. 2. Grass, Dirt & Mud. All over the kitchen floor after we take the kids outside when the ground is wet. Blankets too. And, sometimes, clothes. The kitchen floor is swept and spot mopped daily. A full-fledged, thorough mop is mandatory twice a week. 3. Carpets. We have dark carpets and light furred kids. Vacuuming happens every single day. The steam cleaner gets a spin once a month. 4. Dog toys. Everywhere! We have a large basket of doggy toys in the living room, but a few dozen are scattered throughout the house. Kitchen floor. Sofa. Our bed. The kid's beds. A few times a week I scan the areas under the bed and living room chair. Grace is not my middle name. I trip over dog toys often. I'm not going to rule out a sprained ankle or broken wrist in the future. 5. Blankets. Our fur-kids have at least 238 blankets (slight exaggeration). A few used to be ours. Now...we all share. These bundles of plushy bliss reside on our bed, sofa, love seat and the living room chair. One of my biggest pet peeves are piles of unfolded blankets. I like them folded and neatly placed. The kids like to pull them down to the floor, make bungalows, nestle underneath, etc. I'm always folding blankets. And, I've given up on making the bed. 6. Dried peanut butter. A few times a week we fill the Kongs or chew bones with peanut butter. By the end of the day, there are dried peanut butter smudges on the carpet, throw blankets, sheets and sometimes...our pillows. It looks like poop. 7. Food prep. We don't purchase store-bought dog food. We make their meals fresh. Every. Single. Day. Baked chicken breasts, sauteed steak, rice, steamed veggies, sweet potatoes, fruit, yogurt and our biscuits. The combination varies. We prep every other day. On occasion we treat them to scrambled eggs, a little cheese, or pup friendly pumpkin muffins. 8. Laundry. We throw a load in most days. Between blankets, apparel (human and pup), throw rugs and towels, there's an abundance. 9. Dog poop. Yard cleanup is a must every other day. 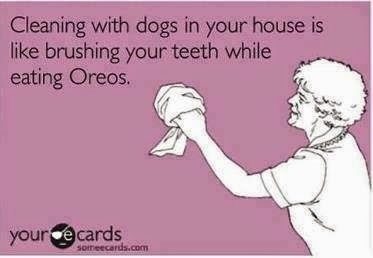 It's not the most enjoyable activity, especially during the hot & humid weather, but it's necessary and a lot easier than cleaning poopy paws. 10. Nose art. Wet noses and windows. In our home and vehicle. We embrace the nose art. 11. A change in routine. Monday through Friday, our routine is generally the same. Breakfast. Back to bed. Snack time. Playtime. Nap. Supper. Etc. However, on the weekends, or if Lisa takes a vacation day, the daily routine is broken. The kids may skip nap time and bedtime is later. They get grumpy and somewhat irritable. True story. 12. General housework. Every. Single. Day. I like a tidy house. I work at home. Clutter distracts me. Like with most people, I have my idiosyncrasies. At the top of my list are messy counters, catch-all areas, and a sink full of dishes.